It's In Other Words Tuesday and Patricia of Typing One-Handed is our host. I find it very easy to demonstrate love to people who are kind and loving in response. Calls you a Jesus freak? Has adopted a lifestyle that offends you? Always seems to find something wrong with what you say or do? Often the hardest people to love are the ones who ...need love the most. 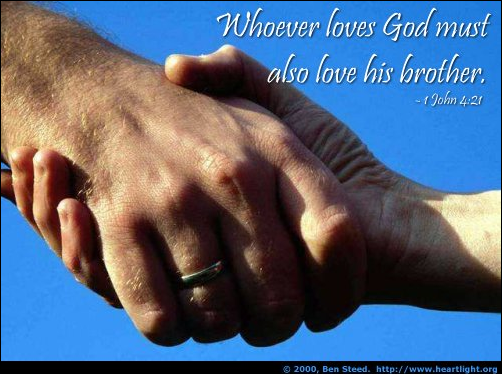 We are to love our Christian brothers and sisters. But after all, there are some who may rub us the wrong way at times. And then there are the people who don't yet know Jesus as their personal Savior. Jesus had to deal with betrayal, humiliation, whippings and nailed to a Cross to die. Stephen was stoned to death as a martyr and yet his last words were "forgive them ...they know not what they do". John 3: 16 doesn't say that God loved some of the people of the world. No, He loved each one of us even before we were saved. 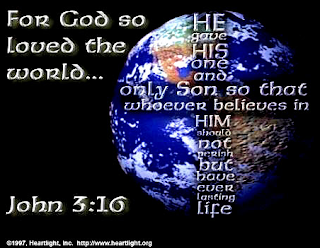 That's why He sent His Son to die for our sins and take the penalty upon Himself. As I consider this, is it so hard to allow Him to work in and through me and ...love others? I pray that the Lord would give me eyes to see beyond the difficult behavior I may find so offensive. Instead I pray that I would remember how much Jesus loves me and extend that love to others. This is a great post. Loving the body of Christ is often challenging, but rewarding as well. Thanks for the reminders. That one stepped all over my toes! 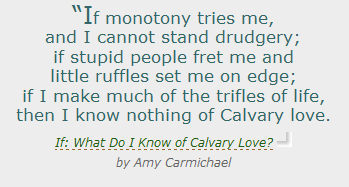 Love the Amy Carmichael quote. What a great way to discuss the Amy Carmichael quote! I got a copy of If recently. Her words constantly make me think in terms of eternity and reality of my Christian walk. Thank you for putting the quote in a way that we can apply so well. "Eyes beyond the difficult behavior" I like that. I've struggled with that. I've had to learn how to look past a beer bottle in order to see the person on the other side in need of my love. We are God's channel to love others, thanks to Jesus, Praises to God. What a truly wonderful post! I thoroughly enjoyed reading it and it gives some wonderful food for thought. It truly is so hard to love those who drives us nuts, but we are called to love those people more. Thanks for your inspiration! This is a great post! All truth! What a great quote. Was is Augustine that said he thinks every morning when God makes the sun rise, He says, "Again! Again!"? There is such a holiness in the everyday moments that we miss if we don't see love in them. I pray that the Lord would give me eyes to see beyond the difficult behavior I may find so offensive. Mmm hmmm. . .me too, me too! May He continually remind us of His great love for us as we learn to love others.